The Soda Factory is proud to introduce An All Singin', All Dancin' Soda Factory Motown Production! Save the date for Wednesday, May 10th- we're calling out all Motown movers, groovers & shakers. 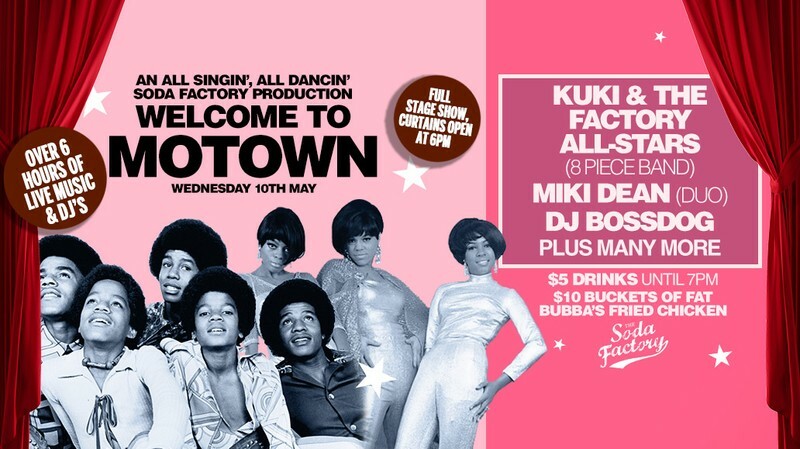 Drawing in on the wealth of The Soda Factory’s in-house entertainment talent, musicians and special guests for over 7 hours of live Motown soul and disco hits. Celebrating the most dancefloor-shakin’ era in musical history, get ready to be Dancin' In The Street as we deliver back-to-back Motown hits from the likes of Stevie Wonder, The Jackson 5, MJ, Marvin Gaye, The Supremes, Diana Ross and many, many more. This is a full stage show & the curtains will open at 6pm. - Live tunes all night! Comin’ in hot on the night are our Motown cocktails, so grab a guy, grab a girl, and Get Down On It. Like so many of the Motown hits, this one’s going to be a classic! Famous american diner eats available until 10pm.